Gold and Precious Metals Sector At Important Juncture! Investors are right to be a little concerned when looking across the metals sector of late. 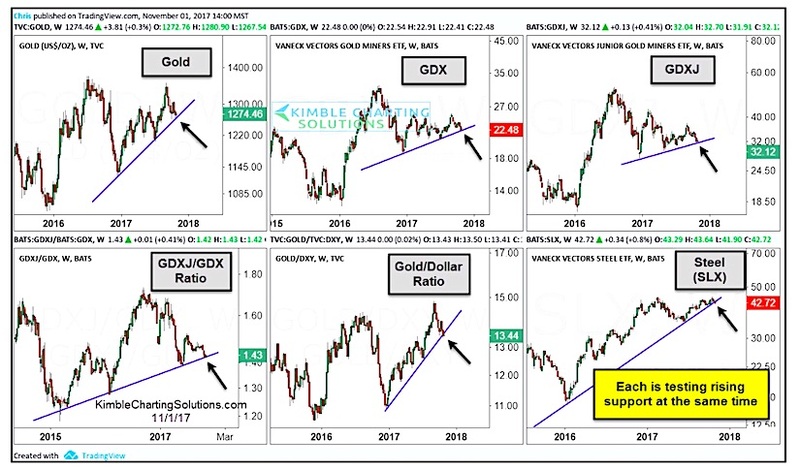 Gold (NYSEARCA:GLD), Gold Miners (NYSEARCA:GDX), and Steel… there all in a short-term decline and approaching critical price support levels. Most of these are trend lines so bulls want them to hold. In the the chart below, you can see 6 different angles on Gold, the Gold Miners, and steel. And in each of these snapshots, you can see that price action is nearing important trend line support levels. The short-term and long term are converging here, so perhaps the next move will have a meaningful impact on your portfolios.